On Sale Now! Free Shipping Included! Save 7% on the Pro-Ject Phono Box MM DC Phonograph Preamplifier,Black by Pro-Ject at The Met Theatre. 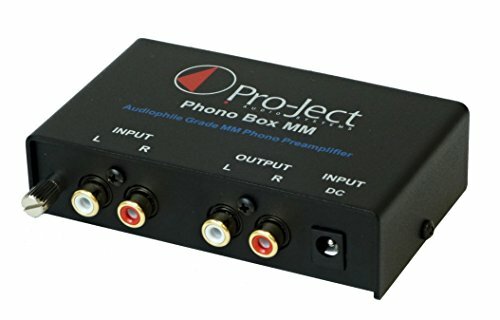 MPN: Phono Box MM DC Black. Hurry! Limited time offer. Offer valid only while supplies last. Since many modern amplifiers no longer have a dedicated phono input, the phono box mm from Pro-Ject is the perfect addition to your turntable setup. Since many modern amplifiers no longer have a dedicated phono input, the phono box mm from Pro-Ject is the perfect addition to your turntable setup. Compatible with nearly any moving magnet cartridge, the phono box mm gives you a superb audiophile music experience at an entry-level price. The utilization of advanced circuitry keeps noise and distortion extremely low, and the metallic case and outboard DC power supply keeps the unit free from electromagnetic interference. Since it's only slightly larger than a pack of playing cards, the phono box mm can be placed nearly anywhere. The RCA input and output sockets are gold-plated to preserve sound quality and can be connected directly to any line-level input (aux, CD, Etc.) on your amplifier.